At the Olympics, being a tenth of a second slower to react can be the difference between winning a medal and missing the podium. That’s why ahead of the 2018 Olympic Winter Games in Pyeongchang, South Korea, athletes are making sure they’re getting the rest and sleep they need to perform their best. Amol Rao, a graduate student in the Faculty of Applied Science & Engineering, is making sure Team Canada has an extra edge. “Our main goal is to help people sleep, something that is especially important for elite athletes,” says Rao. 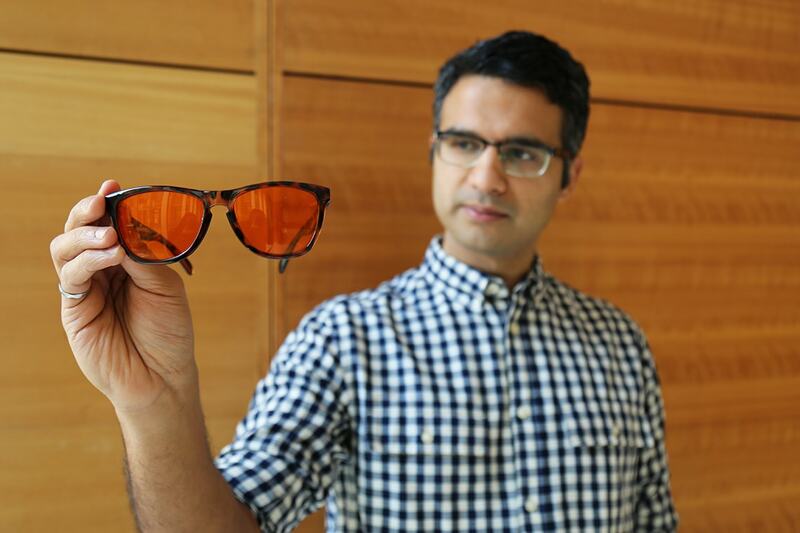 Rao is the co-founder of Somnitude, a startup that develops special glasses that filter out a blue wavelength emitted by phones, tablets and laptops – devices most people habitually check right before bed – that disrupts circadian rhythms and has an adverse effect on natural sleep patterns. By wearing the glasses two to three hours before bed, users can mitigate the effects of blue light and get a better sleep. Rao’s company, supported by U of T entrepreneurship hub The Impact Centre, is working with the director of sports science at Freestyle Canada, a Calgary-based program training freestyle skiers for the Olympics. Somnitude shipped glasses to 30 of their athletes a month before the games. He hopes that by wearing the glasses and promoting better sleep, Team Canada’s freestyle skiers will focus better, train better and improve their times and performance. “We hope it helps them get that extra boost, that extra fraction of a second to win a medal,” says Rao. Although top-tier athletes are used to travelling and competing around the world, Rao points out that it would be beneficial for athletes to arrive at their destination without feeling jetlagged – especially with the time difference between South Korea and Canada ranging from 12.5 hours in Newfoundland to 17 hours in British Columbia. In January, the company launched Chronoshift, a mobile app to help ease jetlag. “What an athlete could do is put in where they’re leaving from, where they are going to – in this case, South Korea – and in the days before their travel, they would get suggestions on how they can shift their schedule, using light, our glasses, waking and sleeping times, to align with the sleep schedule of South Korea,” says Rao. When the Winter Olympics begin this week, Rao will be paying extra attention to Team Canada’s freestyle ski team. If the athletes find the glasses helpful during the competition, Rao plans to step up his partnership with Freestyle Canada. “Maybe in a few years, we can extend our partnerships and help athletes in the Summer Olympics, too,” says Rao.